We have a pocket chart hundreds board that we add a number to each day. I have the students close their eyes and remove a number from the chart. They then open their eyes and guess the missing number. As the year goes on we discuss strategies for figuring out the missing number besides starting at one and counting. Eventually I have them tell me the number and say, “How did you know?” That way they can tell the strategy too. Lisa, we’ve discussed Calendar before and maybe some of these ideas will help too. I’m always interested in how teachers make this an involving, fun, ritual. Calendar Time: Is It Still Important? Add in ten frames representing the date. Tally marks, or straws, or paper clips to count how many days you have been in school. Patterns for the numbers on the calendar. Plus we do our Character Ed “lesson” and go over that and discuss what today’s good news is (let kids tell you something good, new, or exciting that happened). What about a book spotlight? Have a student each day share about a book they have read at home that they really liked. Not only would it promote reading, but give students a chance to learn some presentation skills without the craziness of a traditional show and tell. I have a “mystery bag” (seasonal/theme related gift bag). I use it for addition and subtraction. First I say “I’m putting in 4 white snowflakes” (any manipulative). “Next I’m putting in 2 blue snowflakes. How many are in the mystery bag now?” Give them think time, then ask someone. Ask the others if they agree or disagree. Have that student come check by counting. We then write the number sentence on the board. Leaving these in the bag, I then take some out for subtraction and follow the same steps. We do a little song…. Well. lots of songs! Even outside the box songs….to get the kids engaged…like some hiphop Alvin and the Chipmunks… If they work really hard during calendar then that’s how we end–with some wild dancing!!! . Guess my word! I have a secret word written down and every day I pull it out to reveal one letter at a time…it’s awesome to see how their guesses change from day to day depending on the letters! This week were doing words with blends and digraphs! I did a real-world math “problem of the day” when I taught Kindergarten. We talk about what information we have gathered from the calendar and they use a chart tablet to write sentences. 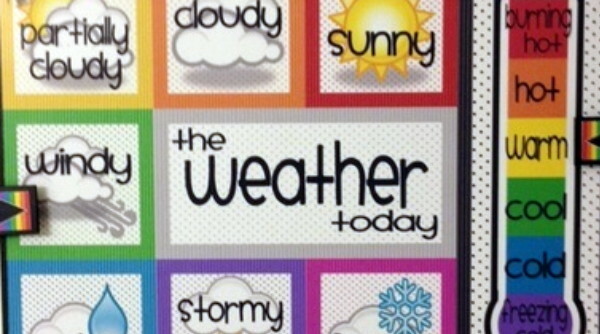 Today is…., our activity…, the weather…, line leader…, menu, etc. Then we use different colored markers to circle or underline capital letters, punctuation marks, sight words….anything I want to reinforce from reading/English CCS. The kids enjoy finding and marking the different things. I made a color code so I use the same color each time for each thing we mark. I think we have used 7 colors so far. Go to kidscount1234.com and purchase Shari Sloane’s calendar book. Love it! It has so many wonderful activities (reading and math) to go with the calendar. If you look on Pinterest for “daily news” there’s a blog with tons of different ideas. We just started doing this because our calendar was getting boring. I used my 100s chart to teach direction. Put a small sticky note on a number to represent a destination like the park, sledding hill, ice cream shop, etc. Choose another number to begin from. Post N S E W symbols on the 4 sides. Each box is one mile. One child rolls a die. He/she states “go 3 miles N or S, E, W.”. They have to use the number on the die. If they cannot use that number they need to pass it on. They like this because it is like a game and different!! You could make teams also to see which team gets there first. I had some die I made that only had 1,2 or 3 on it so it lasted longer. I usually did this once a week the 2nd half of the year. Good luck. Calendar time does get old! I would write a note to the class on chart paper every day telling them what we were going to do. We would read it and then they could find and circle specific letters in different colored markers. I would write the letters on top so if the Aa was in red they would circle all the A’s in red etc. One of the things my kids love is a count-down chain. As part of my daily calendar activities, I use paper or plastic chain links and we take one off each day to count down to a fun activity, party, holiday, field trip or school vacation (right now we are counting down to “pajama day” next week). You can incorporate patterns by making the chain links various patterns, and of course discuss subtraction, counting down and introducing/writing subtraction number sentences. I read Maurice Sendak’s Chicken Soup with Rice poems every month. I have put them on posters and hang it the entire month. You can incorporate letter sounds, punctuation, letter Id, sight words etc. we sing them all at our end of year celebration. Kids love it! We do money during calendar. For example, on January 24 we put 24 cents on the piggy bank poster. We trade coins, name coins, do coin poems, etc. I can say my coins in order. The kids really love this song and it has helped when they go to first grade as well . I put a penny up each day starting day 1… Then we name it and practice its value… Eventually, we exchange pennies for nickels, dimes etc… For the kids who know the coins the counting money is a challenge, while the kids who still need practice naming coins and values get what they need. Add a straw for each day…bundle on the 10s and 100. Adding a dot on a ten-frame every day. Do patterns. I have a pocket chart calendar so we have to predict the next number and what the next pattern piece will be. We also have a chain of links. Each group of 10 is a different color so we can practice counting by 1s and 10s. Hope this helps. I also do the straws and bundles of 10. I do the pattern on the calendar. Each week I put a new word up that says “hello” in another language. We use that word when I call attendance all week. It really enlarges their vocabulary of one simple word. Bought the words at Lakeshore. As you are tracking the temperature of the day make a “Christmas” chain (you know, the construction paper loops) using paper in the corresponding colors of the thermometer. Hang the chains month by month to make a really cool graph.